STOP!STOP! Don't pass over this house! I hope I have your attention now. Its just that this house has been for sale before, for a lot more money, & you might have dismissed it. Well, now, its been reduced to a very good price. So come with me, & have a proper look. Downstairs you will find a huge living room, with a double height, beamed ceiling, a separate dining room, & a kitchen, fitted with oak units. all these rooms are linked by glazed doors, & have large windows, giving wonderful amounts of natural light. A bathroom, separate toilet, & utility room complete the downstairs space. Upstairs you will find 4 double bedrooms, the master has 2 double sized windows, more lovely light. A bathroom, with toilet, & another room, that would make a good, single bedroom. If you were looking for more bedrooms, the attic would convert really well, into 2 more. Outside, to the front, there is a large courtyard, a piece of the garden, a barn, garage & huge hanger. 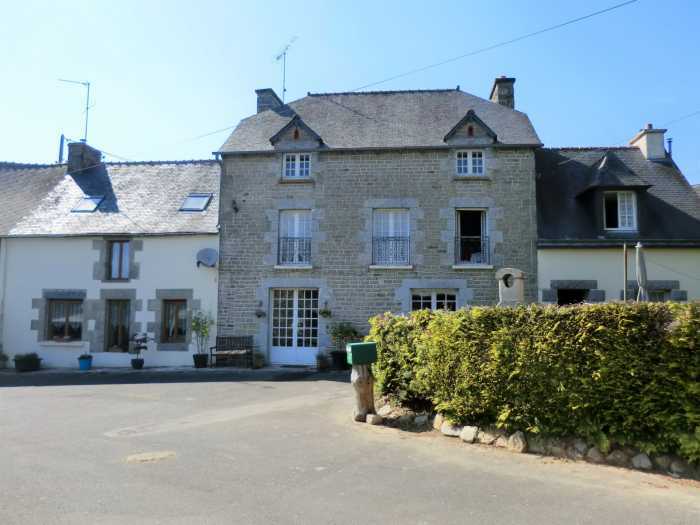 To the rear is more garden with an orchard, & fantastic views over rolling Breton countryside. The house is at the end of a quiet lane, in between Plessala, & Plemet, 2 great villages, with all facilities. The area, is quiet, calm, tranquil. So there it is, a great house, now at a great price. I'm sure you will agree, its worth a look. Note.. The house is attached at the far end, on the left as you look at it. The house it is attached to is empty, & likely to remain so. The house is in a small hamlet, so there are other houses around, but not close, & the house is not over looked. Double glazing. Fireplace, Internet, Window shade. Barbecue. Car port. Garden to the front, and the back, courtyard at the front. Utility room, water heater, washing machine etc. Was used for animals. Good condition, convertable. Huge Hanger, roof, walls, open to front. Parking for 6 cars, or camping cars. Wood floors Double height, beamed ceiling, log burner, 6 windows, 4 radiators. Tile Fitted kitchen, oak units, Worktops, sink. Range cooker. Window to front. Tile Bath with shower above, basin, bidet. Would make a single bedroom.